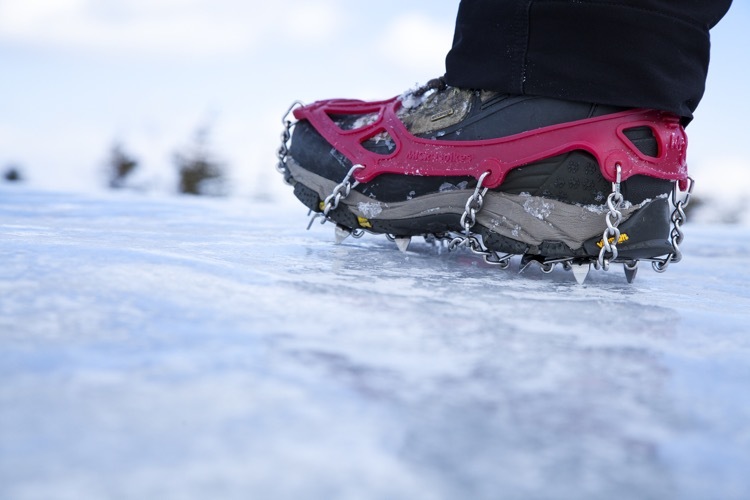 Basic summary: A lightweight, durable and easy to use traction system for ice and snow. A stainless steel undercarriage features twelve 3/8” spikes that are connected to the shoe via a lightweight and flexible TPE rubber harness, and the pair collapses down into a small stuff sack for easy pack storage. You’ll be forgiven if the first thing that comes to mind when you think of ice spikes is “cold winter running” – and while that’s predominantly true, it’s also worth mentioning that two of our most important testing sessions with Kahtoola MICROspikes happened during the summer. The longest effort was at the Broken Arrow Skyrace in Squaw Valley, CA last June, a mountain race that had about 75% of the course buried in snow, and extended climbs on slopes in excess of 40 degrees. Kahtoola was a race sponsor, and numerous California runners enjoyed their first experience using spikes at this event. The second occasion was shorter, but more critical: climbing to the Kroger’s Canteen aid station at the top of snow-covered Virginius Pass at 13,100’ on the second morning of the Hardrock 100, just as ice was turning to crunchy snow, and soft-pack was turning to slush. Any slip-up could result in significant backsliding, increasing the risk of injury from a fall, or at the very least requiring extra effort to regain forward momentum. Both of these situations are proof positive that spikes can be a critical part of the trail runner’s gear bag throughout the year, whether you’re venturing into high mountains during the summer or stubbornly grinding out the trail miles through harsh winter conditions. 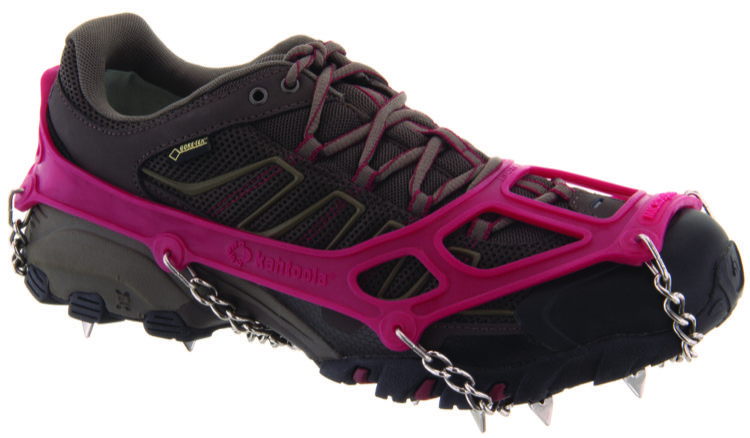 And Kahtoola’s MICROspikes are a very effective, durable, and user-friendly option for newbies and longtime users alike. Most critically, MICROspikes are built to last, thanks to an undercarriage of entirely stainless steel construction. There are 12 spikes per foot, each made from heat-treated and corrosion-resistant stainless steel, crafted in pairs attached to a solid stainless steel plate. 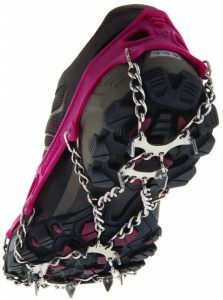 Six of these plates are strategically positioned – 4 in the forefoot, 2 in the rearfoot – and connected by a stainless steel chain network that holds them in place effectively, but allows independent movement of each pair in relation to the others. This layout also decreases the amount of snow that builds up in any particular area on the bottom of the shoe. The top half of MICROspikes consist of a highly durable TPE elastomer rubber that has nice stretch capacity but holds its position very well once set in place. Kahtoola claims the TPE maintains its stretch capacity down to -30 degrees F. The rubber harness is connected to the steel component through 8 reinforced eyelets, and has a raised heel tab to help pull it over your shoe. The front side of the harness cinches down the entire forefoot of your shoe, and can easily accommodate wide shoes and even many styles of hiking boots. 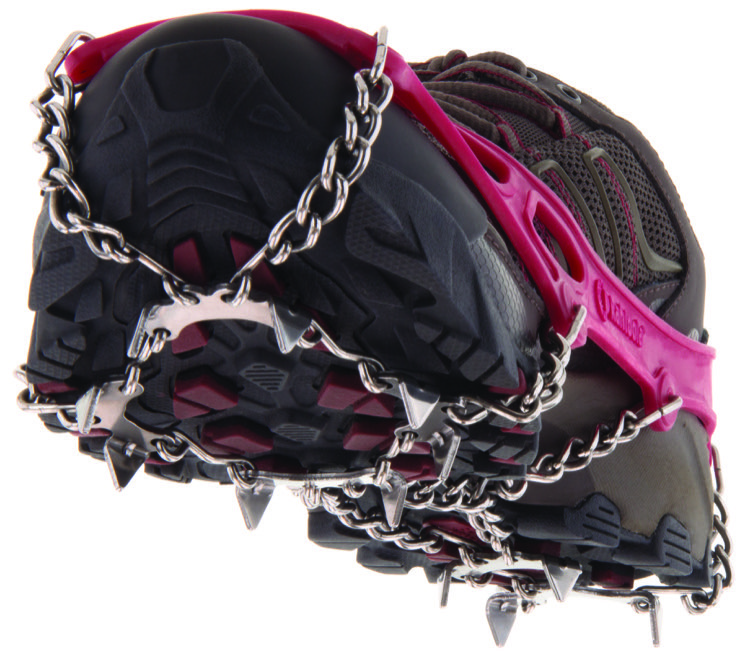 What we like best about MICROspikes are their ease of use. During the Broken Arrow race, we took the spikes off and on several times throughout the day; each time, it took no more than 30 seconds to pull the spikes from their tote bag and strap them on, and even less to take them off and tuck them away again. The seconds you spend in using them have the potential to pay off in minutes saved on the trail – it was a common occurrence to be passed by people while putting on our spikes, only to pass them back soon thereafter and pull away because we covered the terrain more efficiently. And thanks to lightweight construction, carrying the MICROspikes in a hydration pack doesn’t add prohibitive mass to provide some just-in-case insurance if you’re planning a long day in the high country. Like any footwear, MICROspikes will have a finite lifespan, and there are a few points of potential breakdown. The eyelets are the most obvious suspect, but we saw no sign of tearing or cracking in our use this summer and fall. The cleats will gradually dull over time, and while they are fine to wear in mud and slush, they will break down faster if you don’t remove them soon after hitting dry land. Finally, prolonged exposure to sun and/or cold conditions will eventually impact the elasticity and integrity of the TPE, so proper storage is important when they’re not in use. Chances are though, even with heavy use you will get at least a few solid seasons of use out of your MICROspikes, and they come with a 2-year warranty from Kahtoola to assure you’ll get your money’s worth. Kahtoola MICROspikes are available from www.kahtoola.com as well as REI and multiple online vendors.